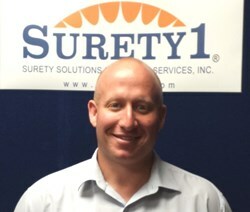 Ryan Tash has joined Surety Solutions Insurance Services, Inc. (Surety1) as Vice President of Contract Surety. Ryan comes to us with the experience we need in order to provide our customers with prompt, efficient and professional service they have come to expect." Ryan Tash has joined the staff at Surety Solutions Insurance Services, Inc.(Surety1) as a Vice President. Tash will be leading the contract surety division of Surety1, which places performance and payment bonds for construction and construction related companies. This type of surety bond protects the party requiring the bond (typically a public entity) by guaranteeing the project is completed and all of the sub-contractors and suppliers have been paid. Tash has been in the surety bond industry since 2007, and prior to joining Surety1 was in charge of the contract department of another California-based insurance agency. Ryan has an MBA from Californian State University, Los Angeles. John Page, President of Surety1 says "the construction economy has really picked up steam this year. As a result, the Surety1 has experienced explosive growth in the contract surety department and we needed to add some depth. Ryan comes to us with the experience we need in order to provide our customers with the prompt, efficient and professional service they have come to expect from Surety1. I am really excited to have such a quality person join our team. " Surety Solutions Insurance Services, Inc. (Surety1) is an independent insurance agency based in Rancho Cordova, California and licensed in all fifty states. Surety1 specializes in the placement of surety bonds and other specialty insurance products. For more information, contact Surety Solutions through its website, http://www.surety1.com, by calling 877-654-2327, or by e-mailing info(at)surety1(dot)com.